It was unseasonably warm last week in the Bay Area. I can’t lie–the minute it hit 70, I broke out my bikini top and sunhat and got my tan on. After eight years in Seattle, my mind has become programed to savor every last bit of a sunny day. And wear ridiculous summer wear when the temperatures climb above 60. After being afflicted with a monster cold virus that put me out of commission for a week, I am finally back on my feet and cooking non-liquid food again. With the prospect of spring right around the corner, I’m trying to cook all my favorite winter veggies while they’re still around. This includes the controversial brussels sprout. Nobody is indifferent to brussels sprouts–you either love the things or hate them. And I totally get it, these cruciferous little vegetables are strongly flavored and can be very abrasive if they aren’t prepared correctly. My mom is a great cook, but when I was little she had an affinity for boiled, unseasoned brussels sprouts. I hated them for years. It wasn’t until well into my adult life that I discovered how delicious they could be when roasted, sauteed, even fried. Anything but boiled. 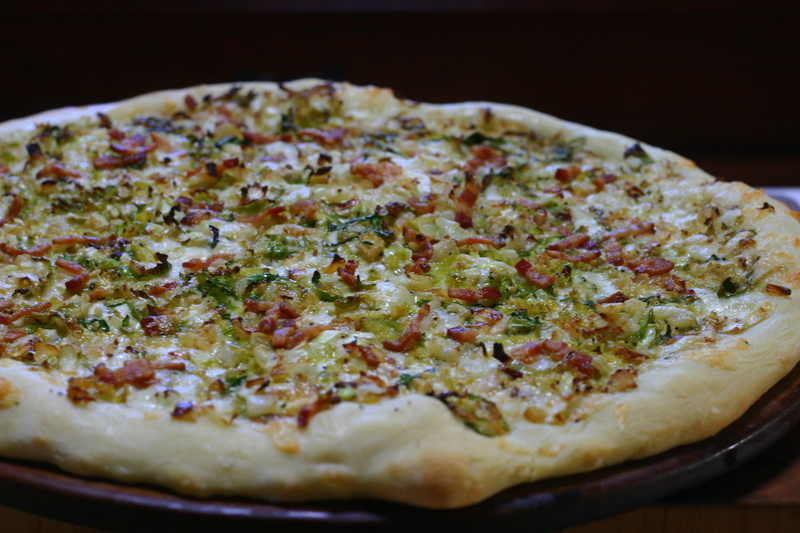 This pizza was inspired by a delicious warm brussels sprouts salad I recently had at a restaurant. Brussels sprouts and bacon (or pancetta) seem to complement each other effortlessly. 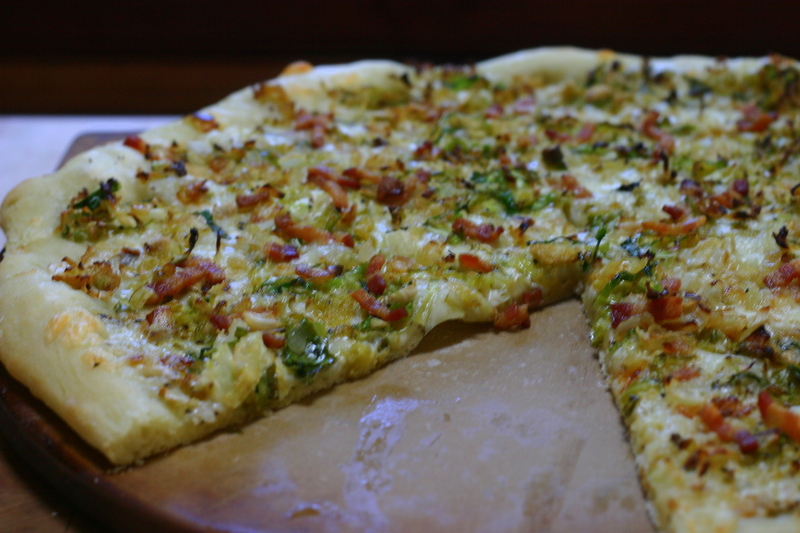 The saltiness of the bacon seems to offset the bitterness of the brussels sprouts and gives the pizza a nice smokey flavor. In this recipe, I render the fat from the bacon and use the grease to coat the shredded brussels sprouts. I know it sounds really unhealthy, but it’s really just two pieces of bacon for the entire pizza–nothing too crazy. I just have a hard time throwing away bacon grease because it adds so much flavor to dishes. It’s like throwing money away. You just don’t do it. I shredded my brussels sprouts into about 1/4 inch slices. This is just personal preference really. They cook much quicker in the oven this way, but you are welcome to quarter the sprouts if you want them to be a little chunkier on the pizza. In terms of cheese, I ended up going with a Fontina because it’s mild and melts well. Trader Joes also carries a very affordable and delicious Fontina–the one with the red rind. If you don’t have access to Fontina, you can definitely play around with other white melting cheese such as classic mozzarella. Finally, I love using this Alice Waters technique for stress-free roasted onions. 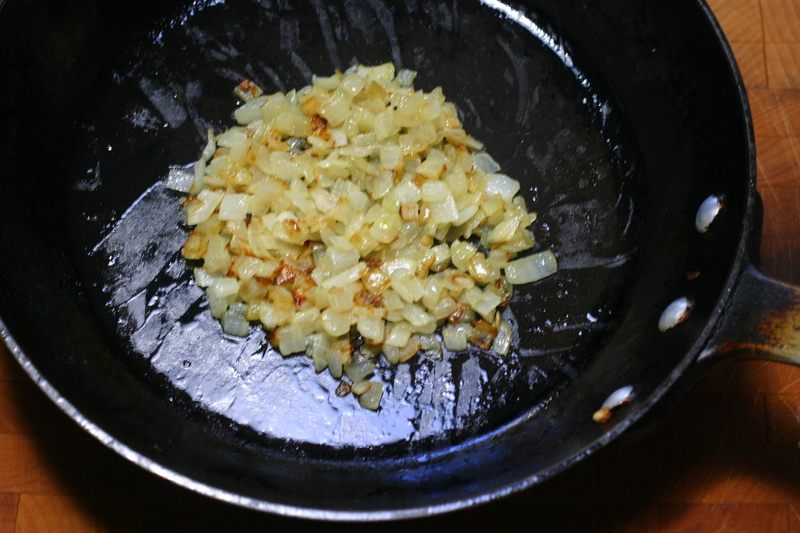 Just coat one small chopped onion with olive oil and a pinch of salt in a small oven-safe saute pan. Pop it in the oven on 375°F for about 30 minutes, and done. I love using these roasted onions on pizzas because they cook while you tackle the dough and other toppings. They also make the house smell amazing.The other day I actually went to Chez Panisse to celebrate my sister’s 18th birthday. I ordered the mushroom pizza, and it definitely had these onions on it! They add a very distinctive flavor to pizzas and other dishes. The hardboiled egg might seem a little random, but it really complements the flavors in the pizza. I usually use about two chopped eggs per pizza, and let people add it to their own slices so they can control the amount. It tastes great and adds some additional protein. Preheat oven to 375°F. Place diced onions in a small oven-proof saute pan and add enough olive oil to coat, along with a generous pinch of salt. Stir well and place pan in preheated oven for 30-35 minutes, stirring occasionally to prevent onions from burning. The onions are ready when they are tender and golden. Meanwhile, prepare the brussels sprouts: trim the ends of the brussels sprouts and discard any discolored or damaged leaves. Cut each sprout in half then into 1/4 to 1/2 inch strips. 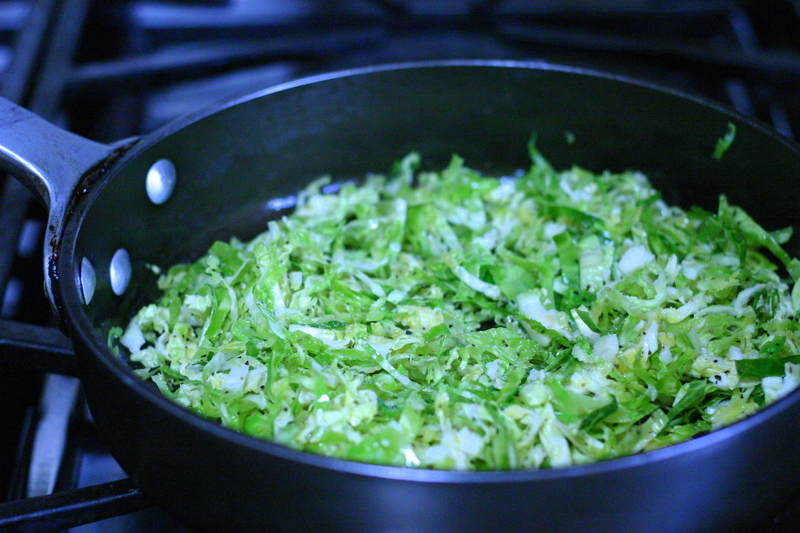 Clean the shredded sprouts with water and pat dry. Set aside. Cut bacon into 1/2 inch slices and add in a saute pan over med-low heat. Slowly render out the fat until the bacon is cooked and crispy. Using a slotted spoon, remove the cooked bacon and set aside on a paper towel. Turn the heat off. Add the shredded brussels sprouts to the pan, and toss with the remaining bacon grease until evenly coated. Add salt and pepper to taste. Once the onions are cooked and removed from the oven, turn the oven up to 450°F. Roll out the pizza dough and start assembling. 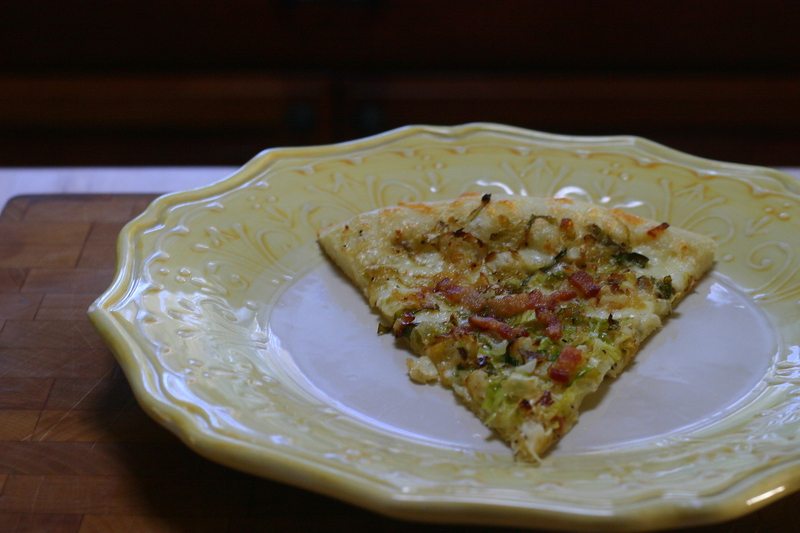 Distribute the grated Fontina cheese onto the pizza and top with the brussels sprouts. Top with the bacon and roasted onions. Brush a light layer of olive oil on the crust so it will brown nicely. Cook the pizza on a preheated pizza stone (if using) until the crust is crispy and the cheese is melted, about 10-15 minutes. Serve each slice with a few drops of fresh lemon juice. If desired, garnish with the chopped hardboiled eggs.